While I was out having coffee with Miss Teri Friday night, I picked up the second issue of Stuffed Magazine by Stampington and Company, the same wonderful company that does Somerset Studio. It's wonderful. The sort of high quality photography you expect from this company and the projects are lovely and artistic. There are a lot that are just pure inspiration and the techniques are varied. There are hand sewn dolls and a pattern for a Coraline type doll that just thrilled my daughter, and amigurumi that made me very happy. Sock dolls and furry monsters. It's a great magazine if you are into making stuffies, and really, who isn't? I think I must make myself a Coraline style mini-me. In amigurumi news, I'm working on a pattern for a base for a Momiji style amigurumi. (you know, all the Japanese words I know are craft related?) Ideally, I'll take notes so I can post the pattern for a simple doll form that will have a channel in the bottom that you can put rolled notes into. I could do it for cards, but I think rolled notes will be easier. Momiji are secret message dolls, they are shaped a lot like kokeshi dolls and have a space in the bottom for a wee note. 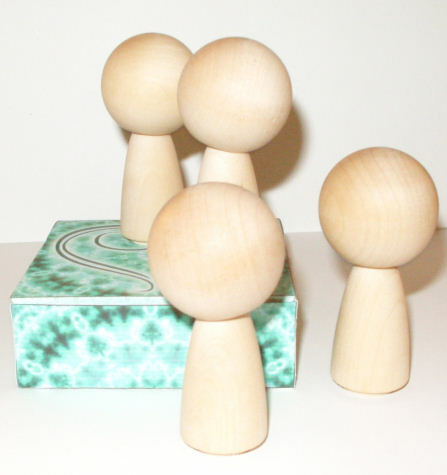 Speaking of kokeshi dolls, blank kokeshi can be a little expensive, but Miss Teri found a dowel cap and doll form combination that's got great proportions for beading kokeshi style dolls. I didn't get the packaging from her on Friday to find out what exactly she got that fit together that perfectly, but I will ask. The dowel caps make perfect really big cute heads don't they? You could paint them, or wood burn them, or use thread crochet to cover them, or do what I'm planning and bead them like my little ninja. First one I want to do will be a little green alien, but I look at them and see Guardians of Oa too. I've been working on crocheted kokeshi dolls. (http://www.zencrochet.blogspot.com) I would like to know where to find the the blank wood forms you mention. Where did you find those perfect dowel caps and doll bases? They're just what I'm looking for but I can't find them anywhere. Teri found them at our local Joanne's Fabric.